Agile and DevOps practices have permeated all walks of the software development world, and are now being adopted by a growing number of safety-critical product developers. In its latest white paper, independent analyst firm Ovum investigates the benefits of integrating ALM and Agile/DevOps practices in regulated development. 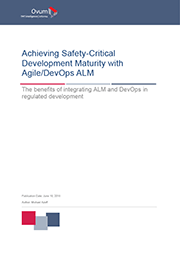 Read on to learn more and download Ovum’s white paper titled Achieving safety-critical development maturity with Agile/DevOps ALM. In this new white paper, Ovum examines the issue of Agile/DevOps adoption and the role of ALM through a case study with BMW. This leading German automotive OEM has embraced Agile using the Large Scale Scrum (LeSS) framework and Intland’s codeBeamer ALM, and is adopting DevOps for engineering. In this paper, analyst Michael Azoff explores the use of templates and frameworks such as SAFe and LeSS to drive Agile adoption in advanced engineering. The paper identifies the primary role of Application Lifecycle Management platforms as helping safety-critical developers show the planning, traceability, and documentation in place necessary to comply with the requirements of standards and regulations. Ovum's new white paper examines a new generation of ALM tools that cover end-to-end development and delivery for Agile/DevOps processes. Discussing the challenges of adopting Agile/DevOps practices in highly regulated sectors, the paper examines the conflict of high development velocities with developers’ ability to adequately manage risks throughout the product lifecycle. The paper finds that DevOps correlates with high performance, but the concept has to be modified to meet the needs of product manufacturing. The key to meeting this challenge is in the right use of automation. Agile and DevOps could not be achieved without good tools (because of the higher process overheads) and the same applies to reducing risk: tools can help in bringing transparency into bottlenecks and issues, in reducing feedback cycles, and in having the right information to hand when troubleshooting. The role of ALM is paramount in this respect. In this new Ovum white paper, Principal Analyst Michael Azoff discusses the barriers and impediments to adopting DevOps in safety-critical industries with strict audit, validation, and certification requirements. Illustrated by examples from various safety-critical industries, Ovum sees that integrating Application Lifecycle Management and DevOps tools is the way forward in regulated development. ALM helps introduce metrics to quantify risks, implement automation to support Agile/DevOps delivery, and bring transparency to an accelerated lifecycle. The new white paper paper examines Intland’s codeBeamer ALM and its use by BMW to support Agile/DevOps product development in compliance with ISO 26262. Download Ovum’s white paper free (PDF, 11 pages) to learn about the benefits of integrating ALM and DevOps in regulated development.